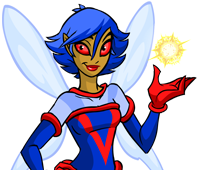 In Invasion: Blastoids, your goal is to aid Mira the Space Faerie in destroying a horde of monstrous comets headed for Neopia, guiding a ship equipped with comet-busting balls of energy known as Blastoids. Use your mouse to aim, moving Mira's ship left or right along a stream of energy at the bottom of the screen. Unlike Attack of the Slorgs, which has a very similar style of play, Invasion: Blastoids doesn't allow you to freely aim your shots, instead firing in a straight line from your current position. While the ship will always remain in alignment with your cursor, it won't necessarily shoot Blastoids straight up; the closer you get to the edges of the screen, the more inward the ship's firing line will point. Due to this, it's impossible to shoot a Blastoid at a point on a comet that is at the very edge of the playing field. To avoid confusion, I recommend only using your cursor as an aiming guide when near the center of the screen. You can launch Blastoids by clicking with your left mouse button, and when your Amulet Meter is fully charged (more on that in a bit), you can press the Space bar to launch a Super Blastoid. In the bonus stage, the left mouse button can be used to launch an infinite supply of Super Blastoids. The object of Invasion: Blastoids is to launch Blastoids (colored spheres) at similarly-colored sections of the incoming comets; if three or more spheres of the same color are connected with one of your shots, they will explode, decreasing the comet's size and ultimately causing it to vanish. If you manage a combo including five or more Blastoids through the course of a level, you will gain access to a bonus stage, where you can rack up points and have more chances to collect additional items. If a comet should reach Neopia, you will lose a life, and the level will start over. If a comet hits Neopia, you'll lose a life. As Neopia is a background element, you don't have to worry about it getting in the way of your shots. The heads of comets are solid, and will break your Blastoids on contact. Asteroids and other types of space debris are placed randomly when a level starts. They'll block your Blastoids, and comets travel around them. Destroying sections of comets will increase your Amulet Meter, which when filled will grant a Super Blastoid. Note that your Amulet Meter is reset at the beginning of each level. Super Blastoids detonate on contact, taking out spheres of any color within a two block radius on each side. Note that your Super Blastoid count is reset at the beginning of each level. If Mira's ship makes contact with plasma, it will be disabled for two to three seconds, and the Amulet Meter will decrease. Shooting a Green Capsule will make Mira's ship invulnerable to plasma for five to seven seconds. Shooting ten Red Planets throughout the course of the game will give you an extra life, so long as you have less than three lives at the time. For the first three levels, a purple line representing your line of fire will be visible; from Level 4 on, you will have to rely on your own judgment. Level 4 also introduces plasma flares, purple energy released by comets that will temporarily take control of the ship away from you. Plasma flares move in a straight line toward where you were when they were fired, and on contact with the energy stream at the bottom of the screen will create a plasma flame that burns for five seconds before disappearing. Starting in Level 5, the time between comets appearing will decrease, and plasma flares will be released more often. In Level 9, comets will begin taking sharp turns in their route to Neopia, sometimes doubling back on themselves. 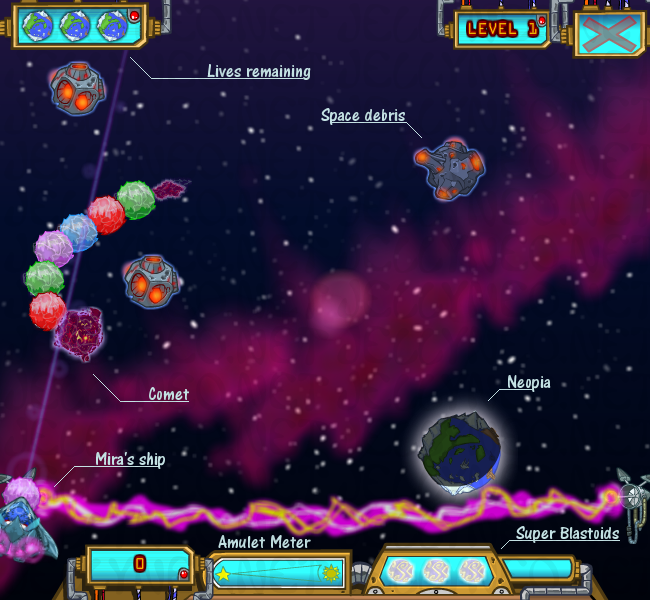 The final stage of the game, Level 10 consists of a single comet that has more than twenty Blastoids in its tail. Occasionally, you'll encounter a comet with a translucent brown segment. These are weak links, and will cause the comet to split in two when shot. While they can be shot with any color of Blastoid, choose the color to use carefully, as it's fairly easy to miss and end up making the comet longer instead. There are several advantages to splitting comets; first, the new comet formed behind the weak link will remain in place for around five seconds before following the original comet, buying you a little time. Segments on the new comet can also be taken out with a single Blastoid of the same color, regardless of how many are in sequence. Since the pieces of these comets can be destroyed with a single shot, it's easy to form incredibly long combos. Just aim the Blastoid so that it will pass through several colors different than it on the comet, and it will leave a trail of new Blastoids between them. Choose a color to use for the combo (the one you just created a bunch of will usually do nicely) and shoot out all the other Blastoids, until you have a long chain of only one color. If you want to try this strategy, keep in mind that the more a given color there is in play, the more likely you will be to get that color of Blastoid. The weak link will act differently depending on its location within the comet. If it's at the very front or back of the comet, destroying it will cause no change to the comet, aside from shortening it. If there are Blastoids of only one color behind a weak link and you try to destroy them, the link will instead break into a new comet without the Blastoids being affected. If you manage a combo with five Blastoids, you will gain access to a bonus stage once you complete the current level. The easiest way to achieve this is to create a sequence of six Blastoids, with the four on the outside being the same color, as seen above. Once the blue has been eliminated, connecting a fifth green to the four now chained together will give access to the bonus stage... and give you six hundred points, to boot! Note that Level 9 will lead directly into Level 10, whether you met the requirement for entering the bonus stage or not. In the bonus stage, you have an unlimited supply of Super Blastoids with which to destroy ten comets. As combos don't award additional points in the bonus stage, you can destroy each comet with a single shot, or fire like mad; just have fun! While asteroids are randomly placed in normal levels, the bonus stage has three set configurations, in which comets will follow a set path. In the bonus stage, a comet reaching Neopia will simply cause the stage to end, rather than costing you a life. In regular gameplay, you will receive 100 points for every Blastoid removed from play; if a combo is a group of four or greater, however, each additional Blastoid over the standard three will be worth 150 points. In the bonus stage, Blastoids are worth 150 points. Each comet is comprised of five sections, and bonus stages contain ten comets, so each bonus stage is worth 7,500. If you can make it into all eight bonus stages available, that's an easy 60,000 points! Note that unlike Nova Defender and some other games, your score won't carry through if you lose a life. Upon losing a life, the current level will start over, with your points reset to what they were when you originally started the level. While collecting ten Red Planet powerups will grant you an extra life, this only happens if you have less than three lives at the time that the tenth is collected. It's best to keep track of how many Red Planets you've collected, stopping at nine until you lose a life. The next Blastoid in your queue will always be random, its color chosen from those currently on-screen at the time the previous Blastoid was launched. However, the odds of a particular color coming up will be influenced by the number of Blastoids already in play; if a comet contains twelve purple Blastoids and only two yellow ones, you will likely receive several purples in a row. The exception to this is the Blastoid you start a level with; this is chosen at random from all colors, regardless of which are in the current comet. If aimed properly, one Super Blastoid can take out as many as five Blastoids on a comet. This is easiest to do in the bonus stage, which is designed with it in mind, but if you have a multi-colored comet about to hit Neopia, a Super Blastoid just may save you! Since the heads of comets are solid and will destroy Blastoids on contact, they can be used to quickly get rid of ones you don't want to use. This can be useful when you're forming a combo, and keep getting the wrong color. The purple tail ends of comets aren't solid, and allow Blastoids to pass right through. Because of this, you can attach Blastoids to the end of a comet, even if it's moving straight up! When a powerup appears, it will remain on screen until the level ends or you shoot it. Because of this, I recommend waiting until you have a Blastoid that you don't want to use against a comet to shoot it. Both Red Planets and Green Capsules appear in bonus stages. To increase the odds of one appearing, let the very last comet in the stage get as close to Neopia as you're comfortable with before dispatching it. The same applies to normal levels; while later in the game you'll be struggling to keep up with the comets, in the first three or four levels you should let the final comet keep moving for as long as you're willing, in case a powerup appears. Using the above tricks does come with a little risk, however. If a comet is close enough to Neopia, it's possible for it to reach Neopia in the time between all of its Blastoids being cleared and the comet disappearing, costing you a life. In the later stages, your Amulet Meter will fill up quickly, and time is of the essence. As plasma will burn on the energy beam for five to seven seconds, and only stuns you for two or three, sometimes it's a better idea to let the plasma hit you outright and drain a bit of your meter. As mentioned in the Gameplay section, the new comet formed when you hit a weak link contains Blastoids that can be removed without a combo of three. This effect is also passed on to any new Blastoids that enter the comet, allowing you to make a long chain that can be taken apart with single shots. Doing this can easily generate several thousand points. If you follow these tips, you'll be on your way to Invasion: Blastoids gold in no time!